BSPHCl AO Documents Verification Schedule 2018 Check Here. BSPHCL AO Revised Joining Status 2018 Check Here. BSPHCL AO Joining Status List I Check Here. BSPHCL AO Joining Status List II Check Here. BSPHCL AO Result 2018 Check Here. BSPHCL AO Joining Letter 2018 Check Here. BSPHCL Notification is out. 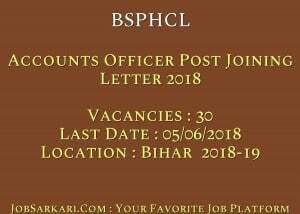 BSPHCL is recruiting for 30 Accounts Officer Post Joining Letter 2018 Posts. You can check BSPHCL - Bihar State Power Holding Company Limited last date, download BSPHCL notification, visit BSPHCL official website and check other BSPHCL Vacancy details.Complete Vacancy and recruitment Details about 30 Accounts Officer Post Joining Letter 2018 vacancies in BSPHCL are provided below by JobSarkari.Com only for you. Last Date For Apply Online. 05/06/2018. Date of Online Examination. Last Week of June. Mode of Payment. Candidate Can Pay Through Online Mode Like Credit And Debit Card. Accounts Officer. Candidate Must Have Passed CA Final Examination. 15. 05. 00. 05. 05. 30. For UR Candidate. Minimum Age 21 Years Maximum Age 37 Years. For SC/ST Candidate. Minimum Age 21 Years Maximum Age 42 Years. For EBC/BC Candidate. Minimum Age 21 Years Maximum Age 40 Years. Age Relaxation For PH Candidate. For 10 Years. 2. Candidate Can Click on Registration Link As Given on Our Website in Important Links. 3. Candidate Need to Fill All the Mandatory Details. 4. Candidate Need to Upload Al the Mandatory Documents Along With Passport Size Photographs As Mentioned in Notification. 5. Candidate Need to Apply Before 05th June 2018. 6. Candidate Can Take Printout of Application For Future Reference. Q. What is the Last Date For BSPHCL Accounts Officer Post Joining Letter 2018 Vacancy ? A. Last Date for BSPHCL Accounts Officer Post Joining Letter 2018 Posts is 05/06/2018. Q. 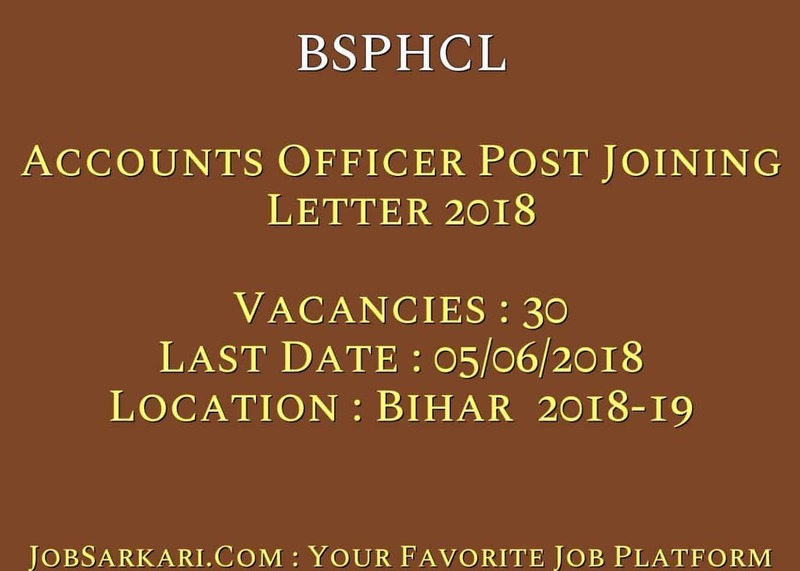 What is the Form Type of BSPHCL Accounts Officer Post Joining Letter 2018 Recruitment ? A. The Form Type for BSPHCL Accounts Officer Post Joining Letter 2018 Posts is Online. Q. How many vacancies are available in Bihar State Power Holding Company Limited Accounts Officer Post Joining Letter 2018 Posts ? A. There are about 30 Vacancies in Bihar State Power Holding Company Limited Accounts Officer Post Joining Letter 2018 Posts. Q. What is the Full Form of BSPHCL ? A. Full Form of BSPHCL is Bihar State Power Holding Company Limited .